"This simple three ingredient recipe will turn any simple hamburgers into a gourmet dinner that is sure to please!" 1Preheat an outdoor grill for medium heat, and lightly oil the grate. 2Grill the onions over medium heat 2 minutes per side. 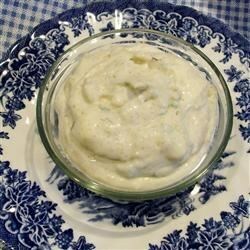 3Combine the cooked onions, mayonnaise, and cumin in the bowl of a food processor; pulse until all ingredients are fully mixed, you may need to scrape the sides and bottom the help this along. Serve immediately or refrigerate for up to two weeks.